The snowy mountain range of the Sierra Nevada in Granada is less than 30 miles from the Mediterranean Sea. Peaks over 3,000 metres, including one of western Europe's highest, together with the Andalusian climate create an environment where scores of unique wild plants are to be found. 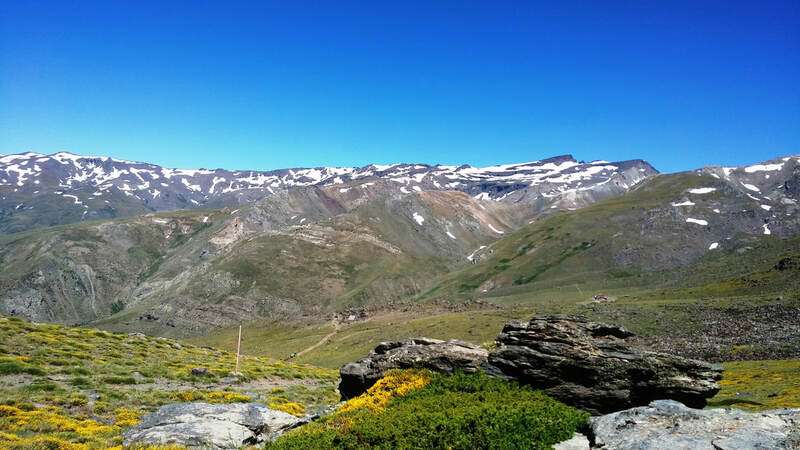 It's great hiking country, offering high altitude experiences to complement the warmer, gentler Alpujarra walks just below. In the high mountains of La Alpujarra, in a small, old village, lives an English painter who has been quietly and faithfully producing some of the most magical work to come out of Andalucia in the past thirty years. La Alpujarra is a great place to explore and walkers love it. From hiking the highest mountain in the Iberian peninsula to pretty strolls via the hamlets, there is something for everyone. Here we began a series of walks for you to choose and enjoy.